Petco Park is the site of the matchup between the Minnesota Twins and the San Diego Padres on Tuesday, August 1, 2017. The probable starting pitchers are Jose Berrios for the Twins and Jhoulys Chacin for the Padres. Minnesota opens at -116 while San Diego opens at +106. The Twins have a 45-50-8 over/under record and a 50-53-0 run line mark. The Padres are 57-48-0 against the run line and have a 54-45-6 over/under record. The Twins have a 50-53 overall record this season. Starting pitcher Jose Berrios has a 9-4 record with an earned run average of 3.76 and a WHIP of 1.20. He has 78 strikeouts over his 83.2 innings pitched and he's given up 75 hits. He allows 8.1 hits per 9 innings and he has a FIP of 3.9. The bullpen has an earned run average of 4.83 and they have given up 397 base hits on the year. Teams are hitting .273 against the bullpen and they've struck out 299 hitters and walked 127 batters. As a team, Minnesota allows 9.7 hits per nine innings while striking out 7 batters per nine innings. They are 26th in the league in team earned run average at 4.87. The Twins pitchers collectively have given up 990 base hits and 497 earned runs. They have allowed 152 home runs this season, ranking them 4th in the league. Minnesota as a pitching staff has walked 336 batters and struck out 716. They have walked 3.3 men per 9 innings while striking out 7 per 9. They have a team WHIP of 1.45 and their FIP as a unit is 4.99. As a team Minnesota is hitting .251, good for 20th in the league. The Twins hold a .406 team slugging percentage and an on-base percentage of .328, which is good for 11th in baseball. They rank 18th in MLB with 8.6 hits per game. Miguel Sano is hitting .267 with an on-base percentage of .358. He has 95 hits this season in 356 at bats with 70 runs batted in. He has a slugging percentage of .517 and an OPS+ of 130. Brian Dozier is hitting .247 this year and he has an on-base percentage of .329. He has totaled 98 hits and he has driven in 52 men in 397 at bats. His OPS+ is 103 while his slugging percentage is at .438. The Twins have 889 hits, including 187 doubles and 112 home runs. Minnesota has walked 390 times so far this season and they have struck out 878 times as a unit. They have left 762 men on base and have a team OPS of .734. They score 4.55 runs per contest and have scored a total of 469 runs this year. San Diego has a 47-58 overall mark this year. With an earned run average of 4.22, Jhoulys Chacin has a 10-7 record and a 1.29 WHIP. He has 101 strikeouts over the 119.1 innings he's pitched. He's also given up 111 hits. He allows 8.4 hits per nine innings and his FIP stands at 4.32. The bullpen has an earned run average of 4.38 and they have given up 323 base hits on the year. Teams are hitting .231 against the Padres bullpen. Their relievers have struck out 399 batters and walked 135 opposing hitters. As a team, San Diego allows 9 hits per nine innings while striking out 8.5 batters per nine innings. They are 23rd in the league in team earned run average at 4.67. The Padres pitchers as a team have surrendered 934 base knocks and 483 earned runs this season. They have given up 140 home runs this year, which ranks 10th in Major League Baseball. San Diego as a staff has walked 342 hitters and struck out 878 batters. They give up a walk 3.3 times per 9 innings while they strike out 8.5 per 9. Their team WHIP is 1.37 while their FIP as a staff is 4.47. As a team, they are batting .236, good for 30th in the league. The Padres hold a .402 team slugging percentage and an on-base percentage of .301, which is good for 30th in baseball. They rank 30th in MLB with 7.8 hits per contest. Manuel Margot comes into this matchup batting .281 with an OBP of .321. He has 81 hits this year along with 23 RBI in 288 AB's. He maintains a slugging percentage of .431 with an OPS+ of 97. Wil Myers is hitting .246 this season and he has an OBP of .326. He has collected 93 hits in 378 at bats while driving in 49 runs. He has an OPS+ of 106 and a slugging percentage of .463. 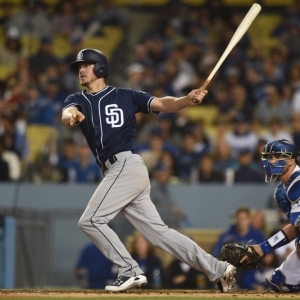 The Padres as a unit have 821 base hits, including 147 doubles and 127 homers. San Diego has walked 301 times this year and they have struck out on 985 occasions. They have had 671 men left on base and have an OPS of .703. They have scored 3.81 runs per game and totaled 400 runs this season. Who will win tonight's Twins/Padres MLB game against the spread?